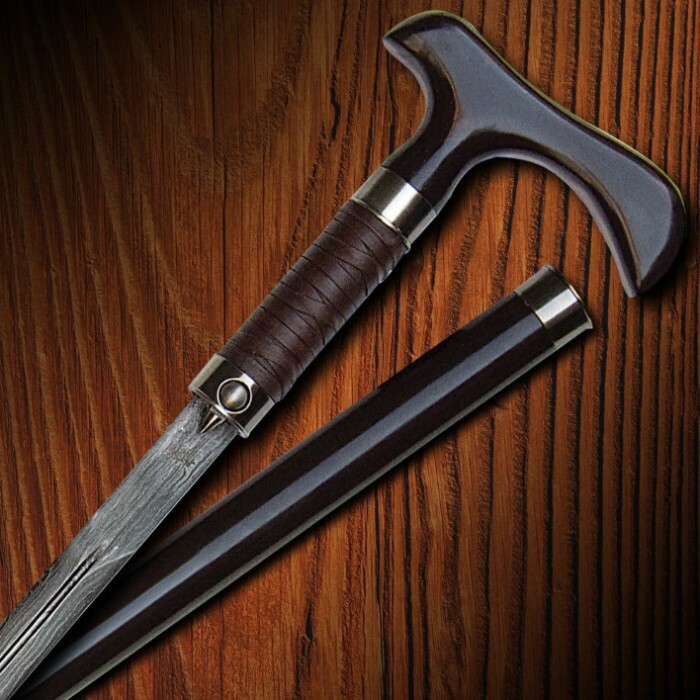 The Rurousha Forged Gentleman's Sword Cane is built with the suave, sophisticated gentleman in mind. The 23" Damascus steel blade features a blood groove and locks into the wooden shaft with the help of a hidden blade release mechanism. The double-edged blade features sharp edges on both sides.The hardwood hook handle is smooth and offers an elegant touch to the design. Leather wrappings and antique-finished hardware add additional style to this quality fantasy sword cane. Not worth the price at all. The blade is of good quality, i'll give it that. its like they took the blade of a $100 sword and dropped into a $10 cane, which by the way is at an awkward length to be used as a cane for an average height man like myself. very plastic and cheap feeling. not satisfied at all. Trueswords usually gives you things that feel like a million bucks but costs only $10. This feels like $10 and cost me $130. I just received mine today, I went with the buy one get one free deal and got two, I was not disappointed wit the qulaity at all. The blade is a beauty and extremely sharp, the leather wrapped handle is very stylish and makes for a comfortable grip, it's also very light weight and easy to wield. The only negative thing I have to say about my purchase is with one of the canes the sword doesn't secure into the shaft very tightly and wiggles a bit. The size is impressive, even a little TOO impressive, if you aren't at least over 6 feet tall. It is 39 inches long, compared to all may other canes and walking sticks which are 34 to 36 inches (for a 5 foot, 10 inch man). The scabbard by itself is 32 inches long, made out of light wood (203 grams, including the plastic tip and pot metal throat) varnished or lacquered a pleasing black color to match the plastic handle. The diameter is 29mm at the top, tapering slightly to 25mm at the bottom (which is over an inch, even at the thinnest). This is thick, but hopefully not quite enough to arouse suspicion. That is the price you pay to hide a really nice sword blade. Because the sword is hollowed out to 25 inches to house a 24 inch blade, there are at least 4 inches of solid wood which could be cut off the bottom without any loss of integrity. Hopefully you could somehow take off the plastic tip and reglue it. However if you could not reglue the tip on the now slightly larger diameter end (1mm larger, if you cut off about 3 inches), I am sure you could buy a new (and doubtless better) rubber tip for a few dollars. Shortened, this would leave your sword a little less graceful, but more comfortable to walk with, if you are not really tall. I should note It is not really uncomfortable to walk with an extra long cane, it just feels awkward to me as I am so used to my 35 inch canes. I do like the leather hand grip, which looks a little odd, but makes quite a comfortable sword grip. the three odd overlaps actually fit the fingers very well. I do not see any instability or weakness in any part of the sword or cane or connections, but I certainly did not give it any torture tests either. 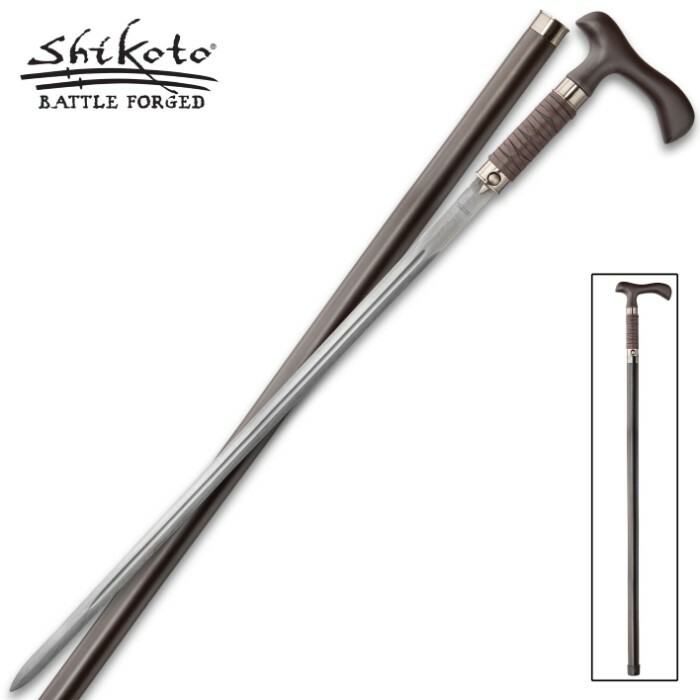 I note that one of the worst reviews about weakness seems to have been left not for this sword cane, but for a different United Cutlery sword with a red wrapped handle, so I discounted that one when I made the decision to buy this sword. The Blade is by far the best part of this sword. On the unsharpened edge by the handle, I think I count 108 layers, alternating hard and soft steel, then it has been etched to allow the softer steel to undercut slightly to show the layering. The blade came coated with some strange grey substance I believe was designed to show off the layers (possibly oil/graphite) If you are not careful It will leave dark streaks on your hands, clothing, or anything or anyone you happen to slash or stab. I wiped mine off and replaced it with a fine light machine oil, which smells better, but changes the color to near silver, and makes the Damascus pattern hard to see. If I had to do it over, I would have left on the graphite lube, which seemed to have been doing fine as a preservative as well as showing the Damascus pattern. The blade is a substantial 5.5mm thick, and 20.5mm wide at the handle, subtly etched "Hand Forged Damascus Steel China" and tapers both in thickness and width down to (at 2 inches from the tip) 3.2mm thick by 15mm wide. From there it goes to a nicely shaped point. The edge is in the Katana or Puukko style, with a single long flat edge, with no second, more blunt sharpening as seen in virtually all Western knives and swords. This, however, would make it difficult to fix if you chip it. This blade is very elegant, very sharp, and, I am sure, very hard to manufacture. I believe this is the finest blade I have ever seen on a production sword or knife. I am VERY impressed. The blade is fairly stiff with just a little flex. 12mm (1/2inch) deflection with a 10 pound weight. It springs back perfectly straight, even when flexed to an inch, which is the maximum I was willing to risk. My only reservation is that it is not really sharpened for about 5 inches on each side, next to the handle. This would, however, allow you just enough safe area to grip it with your other hand for extra strength in an emergency, like if you had to disembowel a really big alien, I suppose. One other thing I might mention, is that when the cane arrived, I could not get it open for a full two minutes. I had thought I might have a defective clasp button, but eventually found it was just a very tight fit, and with a hard pull with the button fully depressed, got it out. by pushing it in and wrenching it out a few dozen times it loosened up. It is still stiff, but that is fine. It will keep young visitors from finding the hidden blade and hurting themselves or the blade. I bought a United Cutlery Forged Sword Damascus with the Red nylon Wrap Ray skin . The Handle has FELL OFF!!!! I had to GLUE It back ON, Now the lower part is falling off . LOOSE ANYWAY NOT HAPPY NOT EVEN BEEN A YEAR OR SO. BEFORE THIS HAPPEN I WAS GOING TO ORDER SOMETHING ELSE BUT NEVER MIND NOW. Now if only these weren't illegal to carry where I live otherwise I'd buy it in a heart beat. I purchased this as a holiday gift for a friend, he really liked it, and it was a purchase he'd thought of making for himself. I'd like one too but would it be too much for the manufacturer to "dress" the handle/cane shaft a bit for the ladies? We ladies like protection as well, with a little elegance. Otherwise, very satisfied with the ordering/shipping process *and* the response from my friend for the gift. I have been disabled for 18 years, I took a fall and broke my back in two places,I'm well over six feet tall.I guess i'm lucky to be able to walk at all. Finding a cane that is at least 39" isn't easy this Rurousha sword cane is a very nice cane the sword is of very good quality. I don't need the cane to hold my weight I need it for balance. I am a well trained swordsman and write many reviews about swords but this time I can say I don't really care about the sword, I only care about having a long enough cane to walk with and this one is very stylish I get many nice comments about the cane. It is my favorite. Thank you. Daniel of Nebraska. sword canes offer an unusual yet stylish look.self defense and style are combined to make these swords,and in my opinion this is the best.